into the new season with limited time only menu items that boast autumnal flavors. The rotisserie everything experts are now serving up three new fall themed offerings. Roasted Garlic & Herb Rotisserie Chicken: Signature rotisserie chicken is topped with herbs, parmesan cheese and a light garlic cream sauce sprinkled with a toasted herb crunch. Meal choices include a Half, Quarter White or Three Piece Dark Chicken Individual Meals with two sides and cornbread. Loaded Roasted Potatoes: Roasted red potatoes are topped with melted cheddar cheese, crisp bacon pieces and finished with fresh diced green onions. Cinnamon Apple Streusel: Flavorful fall apples are baked with sweet cinnamon, sugar and topped with an oatmeal streusel. A savory spin on a classic Italian dish, Rotisserie Chicken Marsala pairs perfectly with new Roasted Garlic and Chive Mashed Potatoes for a rich and bold flavored meal. Boston Market, the rotisserie chicken and contemporary home style cooking experts, today announced the introduction of its new hand-crafted Rotisserie Chicken Marsala – a delicious spin on a classic Italian dish – with sautéed cremini and portobello mushrooms, garlic, fresh herbs and finished with a savory Marsala wine sauce. Created in the Boston Market Rotisserie Kitchen, this signature dish is bursting with flavor in every bite and perfectly complements their new Roasted Garlic and Chive Mashed Potatoes, which are made with real potatoes, milk, butter, cracked black pepper, roasted garlic and chives and whipped until soft and creamy. 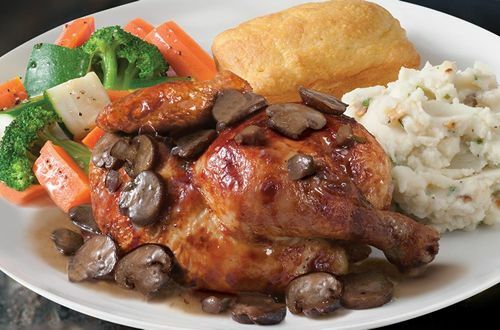 Available now through October 30, 2016 at participating locations nationwide, the new Rotisserie Chicken Marsala dish starts with signature rotisserie chicken, which is prepared by Boston Market Master Carvers every hour and is marinated in a perfect blend of garlic, herbs and spices before being cooked in a continuously revolving rotisserie for 90 minutes until tender, juicy and golden brown. The Marsala sauce, simmered for hours in order to reach peak deliciousness, has a blend of sautéed cremini and portobello mushrooms bursting with rich and loaded flavor. Boston Market, the restaurant famous for its fresh, never frozen rotisserie chicken, today announced its limited time only “2 for $20 Complete Meal Deal. It is available now through April 2, 2015. 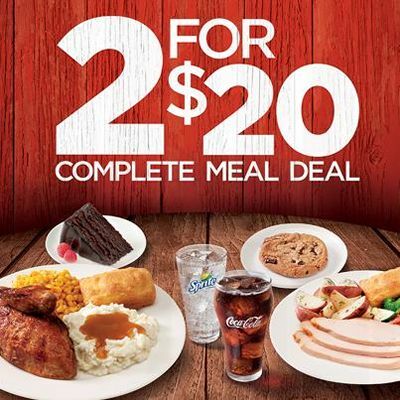 The meal deal includes two Individual Meals, two drinks and two desserts for only $20. Each Individual Meal comes with a main course option such as rotisserie chicken or turkey, two classic sides and a freshly baked piece of cornbread. Boston Market offers guests a variety of healthful options as well, including over 150 Individual Meals at 550 calories or less. As the better burger competition heats up, Boston Market is entering the fray, but with a signature twist. The fast casual restaurant chain, known for its rotisserie chicken, announced the launch of its BLT Rotisserie Chicken Burger, a limited time offering available in all of its 459 restaurants. The BLT Rotisserie Chicken Burger features the chain’s signature rotisserie chicken, thick cut Applewood bacon, lettuce, tomato, and its roasted garlic avocado aioli on a sesame brioche bun. The burger is offered individually for $6.99 and is available as a combo for an additional $2.49. A version without bacon is available for $6.49.